An analysis of the university’s publishing output between 2012 and 2016. The Stockholm University Library provides services to support to about 3,500 academic staff at Stockholm University, which could be summarised in two main tasks: information supply and publishing services. One common denominator for these two functions and one of the primary goals of the library is to provide publications with Open Access (OA). Working towards OA to all research information is also following guidelines from research funders such as the EU (Horizon 2020 initiative), or the Swedish Research Council. OA serves the information supply chain by lowering the costs and opening up for opportunities to make more information available to the end user. From a publishing support point of view, OA has the potential to provide better opportunities for dissemination as the readership becomes limitless. Image ©Stockholm University, available with a CC BY-SA 4.0 license. To follow up on the efforts made in the past few years at Stockholm University, my colleague Gabor Schubert, and I did a retrospective analysis about how much of the output between 2012–2016 has been published with an OA license. We would here like to share some preliminary results to celebrate the OA Week 2017. The full version of the report will be presented in November. The analysis is based on data from the university repository DiVA. The information about publications have been cross-checked with the oaDOI database, and the bibliographic data has been enriched with metadata from CrossRef and the Directory of Open Access Journals (DOAJ). The researchers at Stockholm University publishes on average 4,200 items each year. About 70% of these publications are articles in academic journals. Opportunities to publish OA has increased in the past years, and we would, therefore, like to see if this is reflected in the practice of researchers. In 2016, we found that 33% of the total number of articles published was made available with an Open Access license. This is an increase of 10% compared to 2012. It seems like some of the efforts to encourage OA publishing has paid off, but we still have some distance to reach the goal of making all government funded Swedish research available. The graph below shows the development of the total number of published articles between 2012–2016, and that the number of OA articles increase over the years, despite a slight decrease in the total number of items. Another aspect of measuring the level of Open Access publishing is to consider that there are several options available for authors when choosing to make their work available to the public. The graph below shows the number of OA articles of different kinds between 2012–2016. The ‘Gold OA’ portion refers to articles that have been published in a journal with immediate open access and a creative commons license that only publishes OA content. The level described as ‘Open Access’ also includes the articles published in ‘Hybrid OA’ journals, where the content is made available immediately and with an open license, but where other journal content is still behind a paywall. The level of openness indicated with ‘Public Access’ also include the number of articles made openly available online in one way or another, but where the access level might not be permanent, immediately upon publication or include a license indicating how the content can be reused. The seemingly slower increase of these types of OA in the past years could be related to the slight decrease in the total number of published articles. Measuring of OA levels of articles is, however, not giving us the entire story as 30% of the output is published elsewhere. 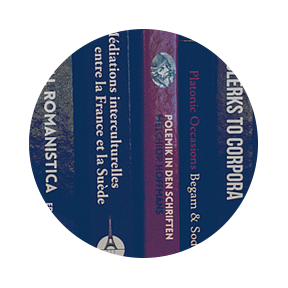 For example, the publishers of monographs or individual chapters in anthologies are not providing digital publications to the same extent and do not contain metadata or permanent identifiers to the content. This means that measuring compliance with OA recommendations is not an easy task. We still have to go through some of our data manually. However, the bibliographic data we can collect indicate that about 6% of the 426 books published by Stockholm University researchers between 2012–2016 is openly available. If we look at data about book chapters in anthologies from the same period (a total of 3,483 items) we find that 1.4% of them is available without a paywall. This leaves room for improvement when it comes to mechanisms to encourage authors to share their work in digital format and with an open license. Nevertheless, we could note that almost half of the book chapters that are available for free download, and where it is possible to follow up on usage, are published by the Stockholm University Press, which is one of the initiatives in place to encourage more sharing of research results. If you are interested in finding out more about how to support more books to be made available, we can recommend the Landscape Study on Open Access and Monographs (Ferwerda et al., 2017). The support for publishing Open Access is just one of the initiatives from Stockholm University Library, where we are also involved national offsetting deals such as the Springer Compact agreement to facilitate the transition to more open publications. Furthermore, we are providing training for young researchers about Open Access and are participating in the Swedish national consortia for Open Data. Flipping Subscription Journals to Open Access – For Whom and to What Cost?